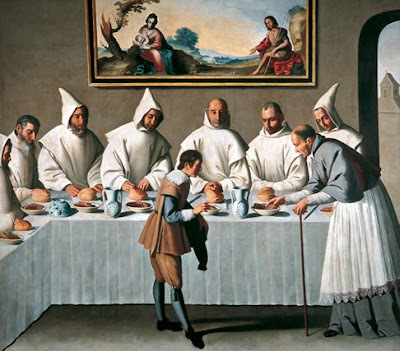 THE DELFT-LIKE PATTERNS I WAS TALKING ABOUT YESTERDAY COME FROM ZURBARÁN'S ST. HUGH OF CLUNY IN THE REFECTORY OF THE CARTHUSIANS. 1633, OIL ON CANVAS. 3070mm x 2620mm. MUSEO DE BELLAS ARTES, SEVILLE. SPAIN. IF YOU CLICK ON THE IMAGE BELOW, YOU'LL SEE THE SAID PATTERNS ON THE TABLEWARE. 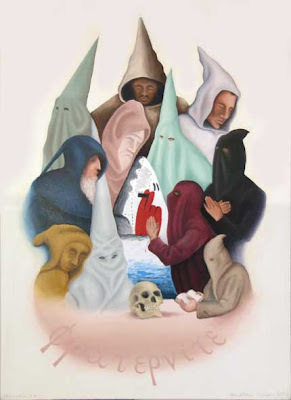 AS A SIDE, MY PAINTING UNDER THE ZURBARÁN, TITLED FRATERNITY (2005), USES THE MONK AT THE FAR RIGHT OF THE ZURBARÁN PAINTING.